For our Mom's birthday, my sister and I set out to paint her a pink armoire. This began with my pink armoire, which my parents purchased for me years ago in the little town of Chincoteague, VA at an antique store on Main Street. My Mom loved my pink armoire, and I have searched online, in antique stores, and in thrift stores for years for a similar shaped armoire in any color--of course pink would have been ideal. I never found anything similar to mine, so for her birthday this year, I simply bought a brand new armoire and started painting. First I sanded and primed (with Kilz) all of the pieces, except in the places that I planned to keep white accents. 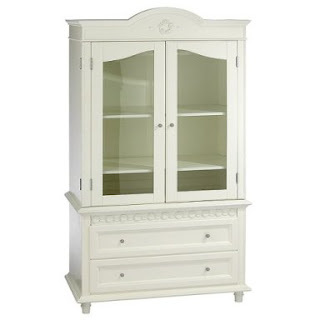 Since the armoire was already a cream color, I felt that would be perfect for the white trim and details. Next, my sister and I began painting. We used Behr latex in Eggshell, named Pink Amour. The painting took a few days (which of course included a few mishaps, as usual), and once it was all dry I sanded a bit on the edges to give it a bit of a worn look. I contemplated using chains to achieve a few dents and imperfections, which would give it more of an antique look, but I wasn't sure if that would be the best, since with the sheen, it has a newer-looking exterior. We made sure to paint inside each drawer as well as in the cabinet itself. We took it in pieces to my parents' home and then took my Mom out for the day so that my dad and fiance could put it all together. They had a bit of trouble with the glass knobs, as the piece came with both glass knobs and metal ones, so they used the metal ones for now. Also, one of the legs snapped (a rear leg, thankfully), and they glued it back together with a bit of carpenters glue. One of the doors also sits out a bit from the other--a very little bit-- but I guess that is what you can expect from something sold under the name "Shabby Chic". All in all, my Mom was very happy with the armoire and my sister and I were both pleased with how it turned out. Although it does not have the vintage charm of my armoire, it is a beautiful piece and it is even more special since it was 'created' by my sister and I.
I want to paint my dresser that color, with my teal walls! (: that looks amazing, great job!